Beatty is a very rural, small town of about 1000 residents. A step back in time with wild burros, alot of quiet, old west. 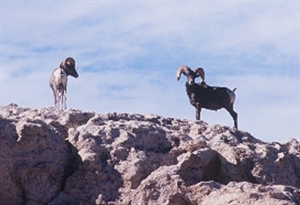 We are known as the gateway to Death Valley National Park. With many unusual attractions, one in particular natural beauty occurs during the month of February with the arrival of Desert Wildflowers (which will begin to appear if the mid sinter and early spring brings some rain). Beatty. Offroading ATV trails are also popular in our area. Bailey’s Hot Springs, a former railroad depot (once known as Hicks Hot Springs), was built around 1905. Today there are three private bath houses available, seven days a week with temperatures ranging from 100 to 108 degrees. There is also a RV park on site with 14 RV spaces. Beatty Mudmound--From a distance this fascinating outcropping of limestone, about 2 miles south and east of town is simply an out cropping of pale gray rock. But once up close and personal, the casual rock hound can find a wealth of excellently preserved fossil remains some 480 million years old: sponges, tiny crustaceans-related to barnacles, gastropods, and brachiopods as well as others. BEATTY MUSEUM--The Beatty Museum and Historical Society that you will visit today is only the latest in what seems like an ever evolving effort to preserve the history of the town, the county, and the Bullfrog Mining District. Marta Becket’s Amargosa Opera House is an adventure that encompasses dance, theater, and art in a way that you may see nowhere else in the world. Goldwell Open Air Museum, in the middle of the desert, is on your way to visit the area’s premiere ghost town (Rhyolite), and suddenly off to the left you see a towering woman and a series of ghostly forms. This is the Goldwell Open Air Art Museum featuring the Painted Lady, a ghostly representation of the Last Supper, a ghostly bike rider, a “desert flower” and others. We have a bus that runs daily to Pahrump, Reno and Las Vegas. Jan 29.0 F° 42.0 F° 55.0 F° 0.8 "
Feb 32.0 F° 45.0 F° 58.0 F° 1.0 "
Mar 36.0 F° 50.5 F° 65.0 F° 0.7 "
Apr 41.0 F° 56.5 F° 72.0 F° 0.4 "
May 50.0 F° 66.0 F° 82.0 F° 0.3 "
Jun 56.0 F° 74.0 F° 92.0 F° 0.2 "
Jul 62.0 F° 80.0 F° 98.0 F° 0.4 "
Aug 61.0 F° 78.5 F° 96.0 F° 0.3 "
Sep 54.0 F° 71.5 F° 89.0 F° 0.4 "
Oct 44.0 F° 61.0 F° 78.0 F° 0.3 "
Nov 35.0 F° 49.5 F° 64.0 F° 0.4 "
Dec 28.0 F° 41.0 F° 54.0 F° 0.8 "
Our Spring temperatures are cool with averages in the upper 50's and highs in the low 70's. Nights are cold with lows in the low 40's. Summer temperatures are warm with averages in the upper 70's and highs in the mid 90's. Nights are cool with lows in the upper 50's. Fall temperatures are cool with averages in the low 60's and highs in the mid 70's. Nights are cold with lows in the mid 40's. Winter temperatures are cold with averages in the low 40's and highs in the mid 50's. Nights are cold with lows in the upper 20's.